Finding engaging books at the sixth grade reading level is always a challenge. Finding nonfiction for that reading list that is both informative and exciting is particularly difficult. Good Sports: From Hardships to Championships engages readers at sixth grade level and up, an it will inspire them while meeting the greater curricular emphasis on nonfiction. The author did a superb job both of choosing his subjects and on the extensive research for this book. Most youngsters love baseball and admire the stars of the game, so the five profiled players – Babe Ruth, Jimmy Piersall, Ron LeFlore, Joe Torre, and Torii Hunter – all with great records and fascinating stories – are terrific choices for this book. Each of the players overcame great obstacles to succeed in this highly-competitive sport. The players faced quite diverse problems, but the obstacles are things most young readers can relate to, such as the pressure to join a gang or being abused by an alcoholic parent, or fighting off the peer pressure to be involved with drugs. Perhaps the best thing in the book is the very authentic portrayal of mental illness that shows it as a true illness that can be overcome with proper treatment and diligence. Sources for further reading are listed in the back as well as a complete listing of all their very impressive career statistics. 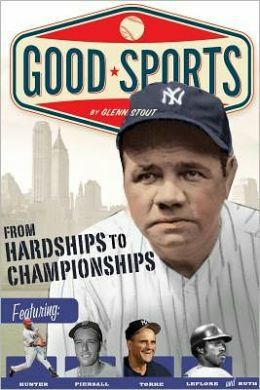 Glenn Stout has several other books in the Good Sports series including Good Sports: Against All Odds, Good Sports: Soldier Athletes, and Good Sports: Yes, She Can! While the publisher does offer some educator resources at http://www.hmhco.com/educators/resources, none is specific to this book. The author’s page at http://www.goodsportsbyglennstout.com/ seems to be unavailable at this time.